WASHINGTON — Stephen Strasburg struck out nine over seven innings, Ian Desmond homered in the seventh to help give the righty his first win in June and the Washington Nationals beat the slumping Colorado Rockies 2-1 on Friday night. 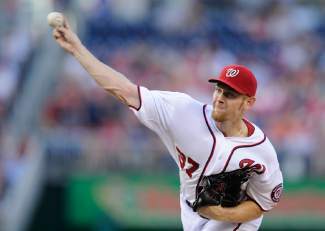 Making his 14th start of the season, Strasburg (4-6) allowed one run on five hits for his first victory since May 31. After DJ LeMahieu’s RBI single in the third inning, Strasburg kept the Rockies scoreless. Colorado lost its fifth straight. Trailing 1-0 with two outs in the bottom of the sixth, Anthony Rendon singled off Rockies starter Tyler Chatwood and came around to score the tying run on Ryan Zimmerman’s double into the right field corner. Facing reliever Manny Corpas (0-2) leading off the seventh, Desmond swatted a 2-0 pitch over the center field wall for his 12th homer of the year. Reliever Drew Storen worked the eighth and Rafael Soriano pitched the ninth for his 19th save as the Nationals moved one game above .500 at 37-36 while the Rockies fell one game under at 37-38. Colorado picked up a timely two-out hit in the third as LeMahieu singled to left, scoring Josh Rutledge from second. That was the Rockies only hit in 11 at-bats with runners in scoring position. They have scored two runs through the opening two games of the four-game series. After Dexter Fowler reached second base with one out in the eighth following a walk and Storen’s throwing error, Carlos Gonzalez and Michael Cuddyer struck out. In two starts since returning from the disabled list on June 16 following a lower lat strain, Strasburg has surrendered one earned run and seven hits over 12 innings. That type of effort has not always led to wins thanks to Washington’s batting woes. In his six losses, the Nationals have scored eight total runs. Corpas pitched 1 2-3 innings, allowing only Desmond’s homer. Chatwood gave up one run and four hits over six innings with four strikeouts and two walks. He entered the game having allowed one earned run in three road starts. The Nationals failed to put a runner into scoring position through five innings. Rendon had two of the Nationals’ five hits. Cuddyer’s opposite field single in the first inning extended his hitting streak to 19 games, the longest active streak in the majors. Cuddyer promptly stole second base and moved to third with one out, but Strasburg neatly ended the threat with a strikeout and grounder.